Posted by I'm feeling lazy. Not just regular lazy, but I want to become one with the couch and just ooze off the side onto the carpet lazy. Like a boneless cat lazy... I'm still not certain how my cousin's cat can seemingly defy physics sometimes, but that's another story. I wanted something where I literally just toss things from my fridge into a pan... so was born this lazy meal: Pasta tossed with herbed chicken, sundried tomatoes, marinated artichoke, mushrooms and broccoli. 2) While the pasta is cooking, prep your vegetables. Marinate the chicken pieces in optional marinade. 4) In the same deep pan, add 1 teaspoon oil, garlic and onions. Cook for a few minutes, then add in mushrooms. Cook until onions are translucent and mushrooms cooked through, about 3-4 minutes. 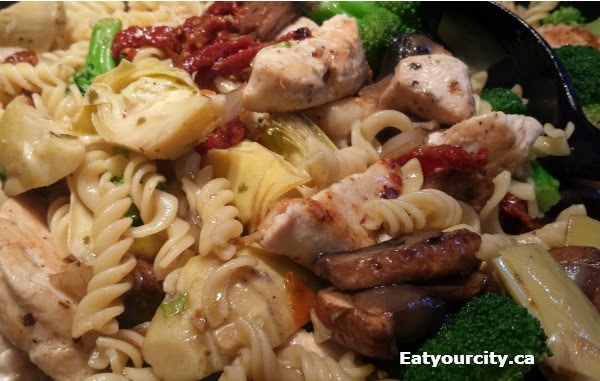 5) In the large pan or a big bowl, combine pasta, broccoli, cooked chicken, vegetables, basil, artichokes, sun dried tomatoes and marinated artichoke oil. Toss well and enjoy!